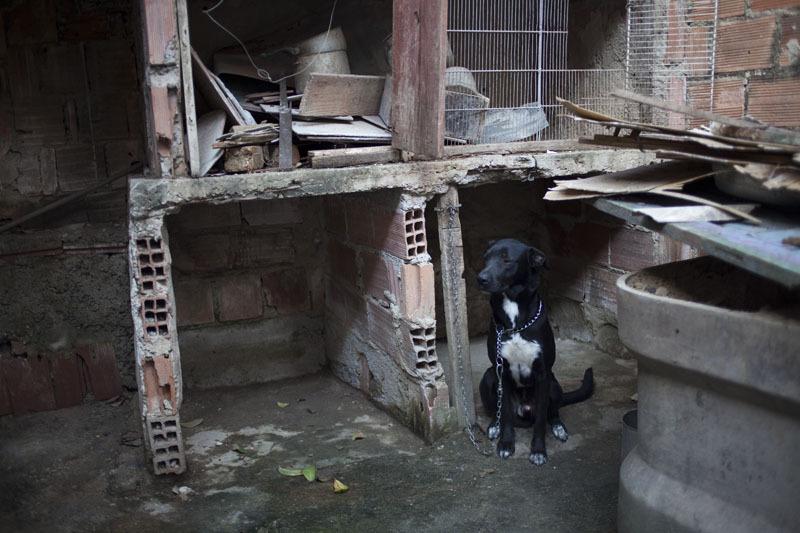 The first thing you notice about José Siqueira’s residence in Niterói are the animals. A small dog with brown and black fur runs out and greets visitors with a few barks, while a larger black dog chained to a wooden post stands alert. When the barking stops, the persistent chirps of José’s twelve pet birds come to the forefront. Many of them jump frantically from perch to perch in cages José built himself. The birds’ plumage hosts a range of colors – some splashed with gray, red and brown with off-white torsos, and some the color of the guavas and bananas that ripen on the trees from where the cages are suspended. José’s property is shaded by the dense foliage of his fruit trees and high walls of the neighboring houses. His neighbors are all family, and he will often trade his guavas for their coconuts. When the sweetest guavas are hard to reach, José, a man of small stature, bends the branches of the tree until the fruits become low enough for him to pluck. He manages to force the branches down to the ground without causing any of them to snap. Used planks and scrap metal abound in the outer area of his house, the foundation of which he laid himself. 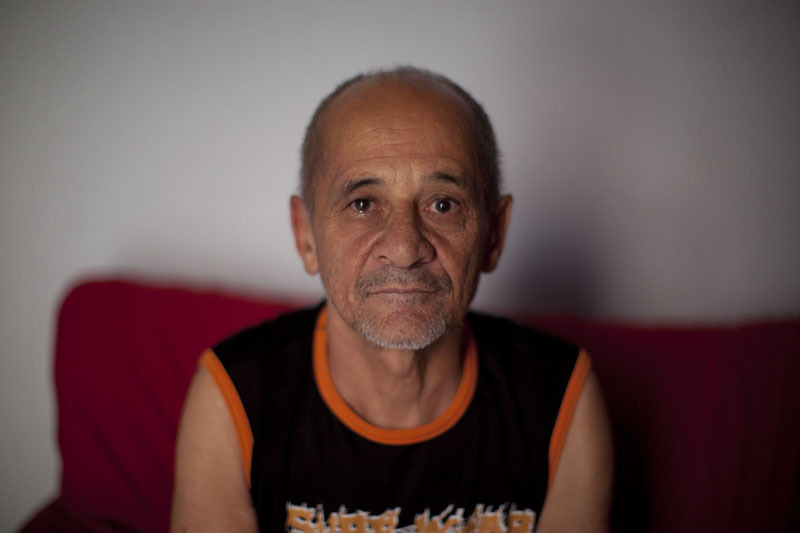 José, now 64, was a carpenter for thirty-four years – more than half his life. His co-workers called him by his nickname, Pimentão, the Portuguese word for chili. On a typical work day, he woke up at four in the morning to make a three-hour commute to his job. After he got off work, he would drink into the evening. 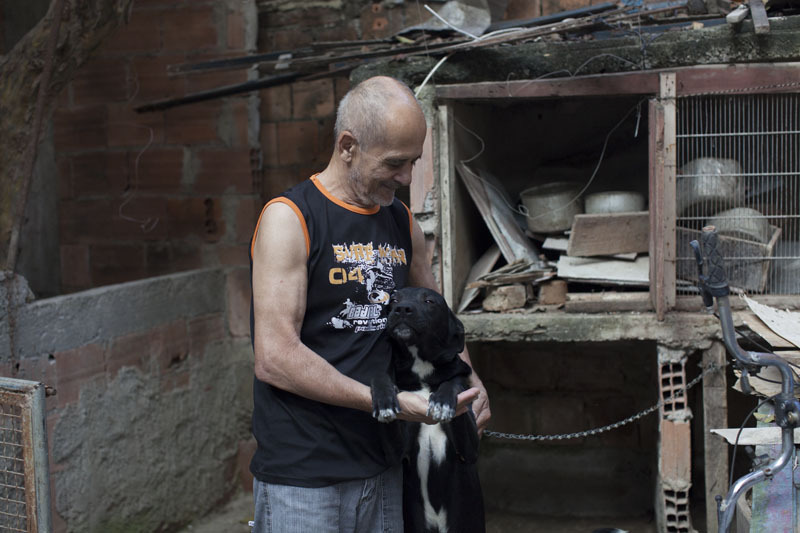 But that was his past life, before he had to deal with hepatitis C.
José Siquiera, age 64, lives in Niterói, Rio de Janeiro. He is a Hepatitis C patient currently undergoing the interferon treatment for the second time. José spends his days taking care of the house, looking after his twelve birds, two dogs, and his guava trees. He has been married for over thirty years and has two sons. José worked hard to provide a good life for his family so they did not have to live on the streets as he did as a child. In 1989, José volunteered to give his blood to a friend injured in an accident, drunkenly forgetting that he had donated earlier the same day. He fainted as he left the hospital and had to receive his own blood transfusion. That transfusion was contaminated with Hepatitis C.
It was only in 1992 that he discovered the disease, when he tried to donate blood again. Hepatitis C screenings were just becoming mandatory, recently introduced in the medical institution. For many years, José felt no symptoms of Hepatitis C. He did not find it necessary to seek treatment. He finally decided to start in 2009 when he was pressured from his co-workers who threatened him to take away his job if he didn’t start. He kept his disease a secret from his family to not worry them. He finally broke the news at the beginning of his treatment. The interferon treatment took a toll on his body and he could not keep up with his carpentry job anymore. Although he tried to continue working with a less physically demanding job, he had to take time off. Having to stay at home was a drastic change for him. The side effects of fatigue, constipation, and itchiness led him to permanently leave his job. He became so depressed that during one episode he could not sleep for eight days. He completed his 48 week treatment, only to find his Hepatitis C was not cured. Now he is on his second treatment. This time he is hopeful because he is convinced the terrible side effects are a sign that the medicine is working. The only thing that keeps him going is his desire to be with his family and see his grandchildren grow up. "God gives you food, but He won't put it in your mouth. You have to put in your mouth to live." TV is not good, music is not good, and nothing feels right, but he is getting used to it. These days, he spends his time walking aimlessly around his house. José contracted hepatitis C in 1989 through an act of generosity. At the time, he was a regular donor of blood at Antônio Pedro Hospital. One night, José learned that a friend of his was in a car accident and needed a blood transfusion. Drunk from cachaça, José forgot he already donated blood earlier that day and returned to give his blood to the injured friend. The combination of intoxication and a large amount of blood loss caused him to collapse outside the hospital. He was taken right back inside and given a transfusion, likely contaminated with hepatitis C given that, at that time, donated blood was not screened for hepatitis. He began taking interferon at the pressure of his co-workers. They told him that he had to start taking the treatment because they feared he would enter the chronic, fatal stages of the disease if he did not. After taking medical leave from work, he began taking interferon every week for 48 weeks. The side effects were severe. He went down to 53 kilograms (117 pounds), had fatigue, insomnia, loss of appetite, constant itchiness and depression. During one of his worst depressive spells, he went eight days without sleeping. Nothing seemed appealing to him anymore; not television, not music, not anything. And it was not only the chemical effects of interferon that caused José’s depression. He had worked since the age of nine, and losing his workday routine left him with a lack of purpose. He felt caged inside his house as he wandered aimlessly through it. “It was as if I was stuck in a pen, going to the door and back,” says José. With a black backpack slung over his shoulder, José makes a weekly trip to Antônio Pedro Hospital, where he receives his interferon treatment. He enters through a waiting area at the front, where you can still hear the noise of Rua Marques de Paraná, a busy road in Niterói. The area is filled with patients clutching medical documents while waiting for their numbers in line to be announced on a digital counter overhead. A wooden engraving of Adam and God’s fingers on the verge of contact – a detail of Michelangelo’s famous fresco on the ceiling of the Sistine Chapel – is displayed on a wall across from the kiosks where patients are attended to by medical staff. While José waits, he recognizes some of the other patients in line and exchanges a few jokes with them. José’s voice is soft and faint against the chatter of the hospital. After going through two waiting rooms, José heads upstairs, walking by a public piano being played by a waiting patient. He arrives at a chilly room where a nurse and a volunteer address him as “Pimentão”. A nurse takes a box of the government-distributed brand of peginterferon alpha out of a refrigerator. Once she reviews José’s papers, the nurse prepares the interferon injection and José lifts his shirt. José’s face cringes tightly as the needle punctures the skin of his lower abdomen. Following the injection, he has a quick psychiatric evaluation, and then he waits again, this time for a physical evaluation by the hepatologist. These two evaluations are performed so he can get prescriptions for medications to help with the side effects of interferon. By the time he gets his prescription, it has been nearly four hours since he arrived at the hospital, with only 30 minutes devoted to receiving medical attention. José adds his prescription to a collection of slips, receipts and forms he accumulated in the hospital, puts all the documents away in his backpack, and brings them back home until he repeats the process next week.